Preparing for Passover includes many rituals and traditions. Every family has their own – from the Haggadah they choose to use, the songs they sing, how the Passover story is acted out (I’ve seen elaborate plays put on)—even what is included on the Seder plate. This is a special holiday, filled with significance about our past and future. 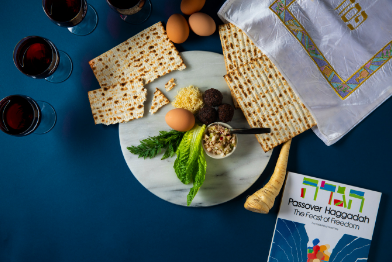 As we gather with friends and family for our individual Seders, we reaffirm our heritage and our values through the telling of the Passover story. It’s almost impossible to imagine what it was like for the Israelites to leave Egypt, despite the terribly oppressive conditions. It is a huge leap of faith to journey to a strange land about which one knows nothing. And, given the current environment regarding immigration, this story feels particularly relevant this year. Faced with such a proposition, the most compelling reason for me to leave would be the thought of creating a better future for my children and their future, the same vision that motivates the work of the Federation. This is what Federation helps do within our own community – make an impact on future generations by reaffirming Jewish values through our services and programs. How do we help strengthen our Jewish community? On April 7, hundreds in our community will make a personal impact by participating in one of the many service opportunities for Good Deeds Day—helping seniors overcome food insufficiency by partnering with Food on the 15th, donating lifesaving blood through a Red Cross blood drive at Temple Isaiah, creating food bags for low income children and toiletry bags for the homeless through Blessings in a Backpack, and various other projects. These acts of Tikkun Olam help reinforce a core Jewish value. Another important role for the Federation is to help bring Israel to Howard County. On May 5, the Federation is hosting its first ever Israel Film Festival at the Oakland Mills Interfaith Center. Spend the day with us and learn more about our special connection with Israel. Watch films, engage in discussion, and eat some Israeli delicacies, all while engaging with the community and our Israeli shaliach. The Israeli elections will have concluded by then, and we are sure to have some lively discussion about the outcomes.